Coningsby Medieval Museum01432 264824 work MuseumSt John Medieval Museum & Coningsby Hospital in on the site of The Blackfriars Monastery, which was a Dominican Monastery home of crusaders of the Order of St. John. St John Medieval Museum & Coningsby Hospital was also an ex-serviceman’s hospital and is now within an attractive rose garden. See the stone Preaching Cross set within the garden, one of the last surviving examples of such a cross. Learn about the foundation of the Coningsby Red Coat Hospital, probably the model for The Chelsea Hospital in London. Explore the Museum, which explains the links between the Crusades, the Knights Templar and The Hospitaller Knights. 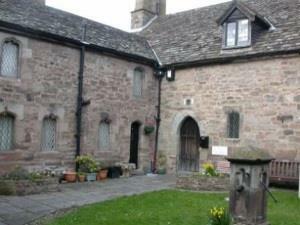 Visitors can view the 13th century chapel, which is still in use today by the Order of St John. The remains of Blackfriars monastery are directly beside the museum. View the many interesting artefacts in the Museum and also visit the Chapel still used today by the Order of St. John. Group and educational visits can be arranged. From the Hereford Town Centre, walk down Widemarsh Street crossing the ring road on the way and the museum is on your righthand side.